A shoe holder for attaching a shoe to a dryer for preventing the tennis shoes from banging in the drum of the dryer while being dried. The shoe holder for attaching a shoe to a dryer includes a piece of material being adapted to fasten about a sole of a shoe; and also includes fastening members for fastening the piece of material about the sole of the shoe; and further includes dryer attachment members securely attached to the piece of material and being adapted to detachably attach to a drum of a dryer. The Dryer Shoe Holder has been updated with the base made of a high density plastic and high performance magnets. Was sold on Amazon. 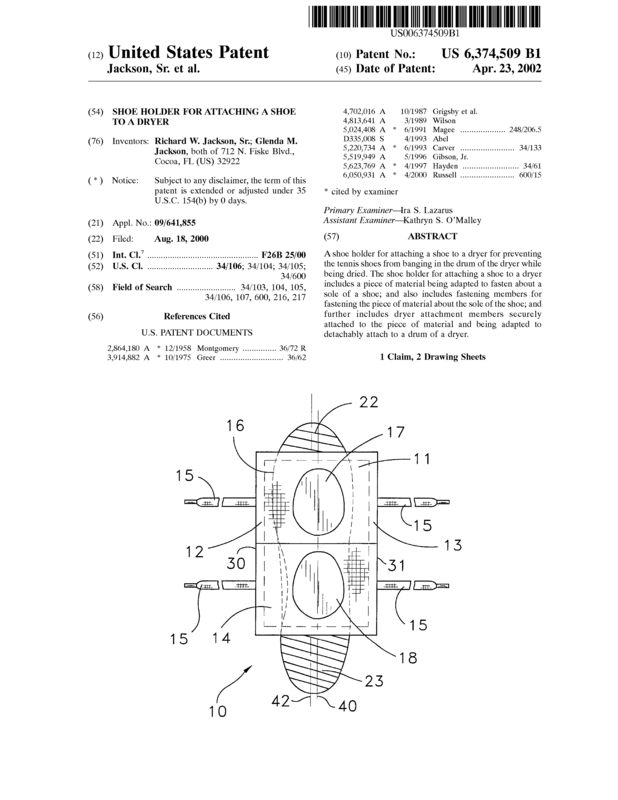 Page created at 2019-04-25 4:23:11, Patent Auction Time.